March can often be a very wet month here where I live, rain pouring down regularly and so I thought - why not talk water this week in the challenge? You could literally use water (perhaps with some distress products for a cool effect!) on your project, you could use watercolor paper, watercolor pens, perhaps a water brush with some distress markers, or use water and paint to mix your own color wash. Not feeling the water? You could use a watery shade of blue! Or how about something with an ocean or tropical inspiration? Perhaps put a scrapbook together with those Caribbean photos, or decorate a frame to give to your friend just back from a cruise. Sandra Mouwen had so much fun spraying lots of color on watercolor paper and watch the blending magic happen. I get all messy (yet again) playing with Vibrant Turquoise and Lemon Zest Dylusion Sprays on some Water Color Paper with the Bubbles Template. It's a kind of magic how the colors all blend together so very well, especially on water color paper. They're so very vibrant. In the back I stamped the Script and Grid stamp with Chrome Yellow and Aquamarine Archival Ink. On top the amazing City and Clock stamps. It had to be the Umbrella Man Die for Tracy this week to create a wonderful dimensional piece of art. This is one die I have actually never used and thought it was about time to correct that situation and the water challenge seemed the perfect opportunity. Metal Foil Tape has been textured using the Riveted Metal Texture Fade to add a little more interest to the umbrella. Wendy Vecchi's White Embossing Paste adds the all important texture to the background and Glossy Accents give me my water droplets. 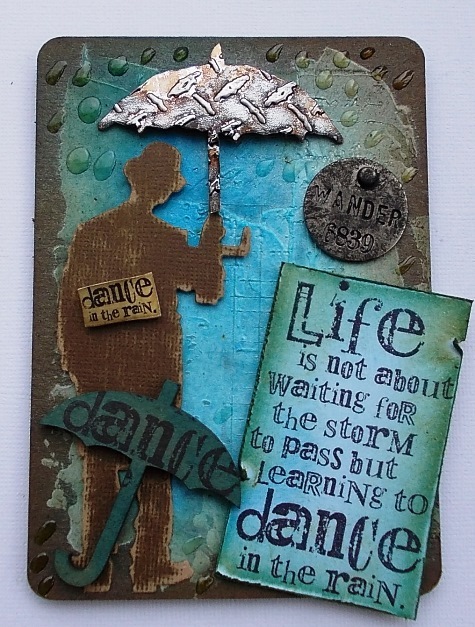 I don't think I have ever danced in the rain, maybe I should try! I (May) love making cards with this stamp and my favorite water reactive products. I am trying to use my gelato set more, and I thought this week's challenge was the perfect opportunity! Mixed with water the gelato colors are so soft and lovely, and this stamp is definitely one of my favorites to sit and color. With a squirt of perfect pearls mist and a bit of paper distressed (and torn while wet with water!) this card came together exactly how I envisioned it. This challenge reminds me that with the right products water can be a most excellent tool in my crafting stash. Our "water" theme this week gave Candy the perfect opportunity to play with her new Dylusions stamp sets to create this underwater adventure. Dyan Reaveley's new Under The Sea, Ocean Backgrounds, Monster Mash and umbrellas from Ruby Rainbow were THE PERFECT stamps to create this wacky underwater adventure. 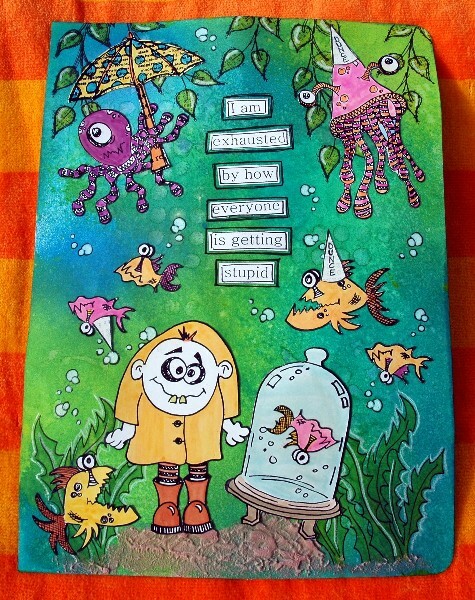 Fish swimming upside down, a jellyfish in a dunce cap, an octopus holding an umbrella and a monster in galoshes; certainly proves Dyan's sentiment "I am exhausted by how everyone is getting stupid!" I tried to capture the crystal clear blues and greens of a Caribbean ocean with Dyan's Dylusions Ink Sprays. Coloring the characters stamped onto Specialty Stamping Paper was a snap with my Tim Holtz Detailer Water Brush and more of Dyan's bright Dylusions Ink Sprays. Trace used three different water techniques on her tag! This tag was so much fun to create! What I love about using water as a technique, is that there is no perfectly planned result. In order to use the water techniques, I grabbed my Ranger Mister and add a few tiny scoops of Perfect Pearls powder; and then filled it up with water and gave it a good shake. I use this mixture on everything, and for this tag the products I used with my mister included the Studio Calico Bubbles Mask, Tim Holtz Distress Markers and Tim Holtz Crinkle Ribbon. For each product I used a different "magical" water technique! Dyan Reaveley came out with delightfully cute and whimsical new stamps this winter which were perfect for this watery theme, and Anita just had to use them. If you knew my Messy Marvin (Or should I say Malcom?) nine year old son, you would understand my love for Dyan's new quirky monster and sea images. They reminded me of him so much I had to use them to make him a little present. I took apart an old tumbler of mine and made it new again to give to my son. Using vellum as my base, I stamped in Jet Black Archival, Dyan's watery images from Under the Sea and Ocean Backgrounds. 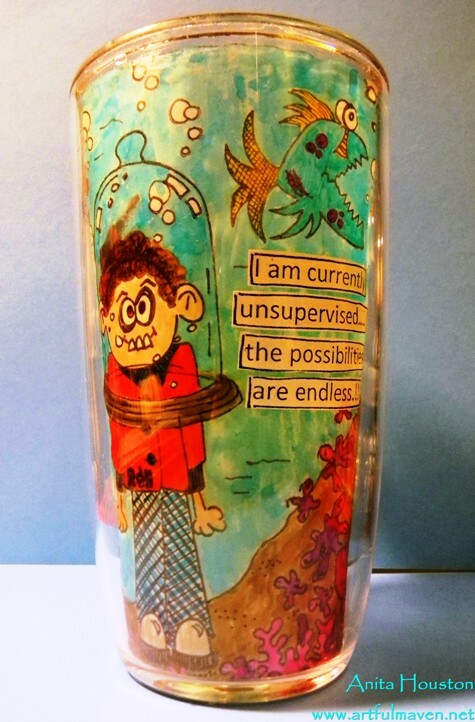 I colored the images in using her Dylusions Ink Sprays, and the water is her new Calypso Teal. I had to alter Malcom some. Can you figure out what I did? 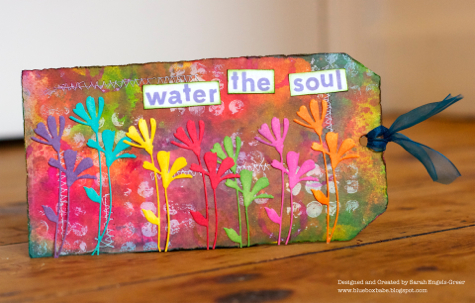 Sarah splashed around with water, Distress Stains and words to create her feel-good tag. Whilst I'm not so bothered about the real ones, I love flowers in all their crafty forms so when I started on this project I thought a field full of daisies with a dramatic inky background would work well together... I'm not someone who does a lot with die cut pieces but when I saw the Simon Says Fresh Daisies I could see my tag blooming before my very eyes! My background uses a lot of the more vibrant Distress Stains which I have let bleed and run by spritzing with a Mini Mister, then I added a little extra contrast by stamping Tim Dots in white paint. My inky, creative time is hard to find these days but it is always good therapy and that was the inspiration behind my stamped sentiment. Don't let your inky soul go dry. Ashli's was excited to use one of her favorite watercolor techniques this week to create her own bokeh style print. Watercolors are one of my favorite mediums to work with. And, one of my favorite techniques of stenciling on an acrylic resist and then painting watercolors over it, was perfect for the look I wanted to create this week! I am loving the bokeh trend right now and I think that the gorgeous softness of watercolor paints will help me achieve a little lens-flare action of my own. After stenciling on my resist, I just went to town with my watercolors, making sure to use ample amounts of water to create the softness. 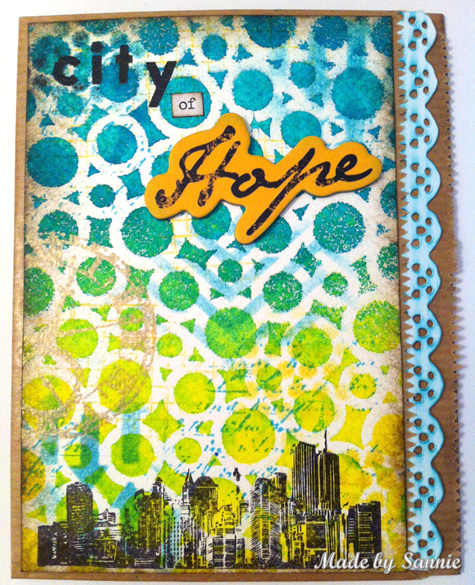 A little Chipboard accent from My Mind's Eye and some die cut alphas from Tim Holtz pull the page together. A finishing touch of journaling around the border and Fantasyland is all scrapped. The bright happy colors of the background made me think of Easter eggs and springtime. I made a beautiful set of Spring Themed Arches. To create the arches I used the Poppy Stamps - Gothic Window Die and die cut out a series of frames from the background papers. To go with the spring theme I used the sweet Stampendous Feather Bonnet Baby and Stampendous Floral Bonnet Baby stamps. 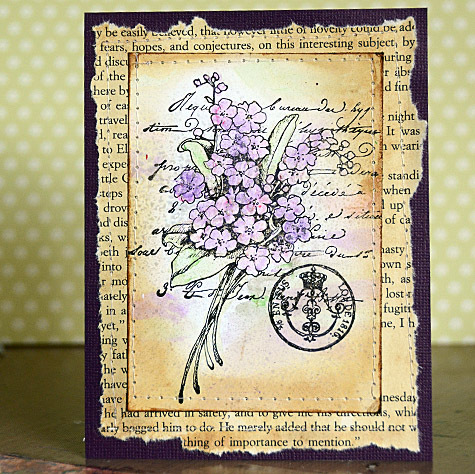 I added the flowers from the Stampers Anonymous - Spring Sprung in the background. I am participating in a swap of Easter Arches and can't wait to share mine. Playing with water and ink to create watercolour effects is one of Anna-Karin's favourite things to do. I had fun making a layout using different water and ink techniques. For the background, I rinsed a sheet of watercolor paper in water, before misting it just twice with Dylusions mist, creating a soft effect, almost of rings spreading on water. The Darkroom Door trees and Tim Holtz bird and rays were stamped with the brush-less watercolor technique. The Sizzix bird and globe were watercolored with Distress Inks, as was the little bird made using a Martha Stewart clay kit. There is no rain coming from the clouds, since the photo was taken on a perfect bright and sunny day. Dan used a few watery techniques and products to create his tale of two hearts. In my exploration of warm- and cold-heartedness I misted with water, painted with watered-down gesso and painted neat distress stain with a water brush, so I think I have the whole watery thing pretty much covered here. The hand uses a favourite technique of mine that I've always called the painted mask technique - I stamped the hand on top of the coloured background, painted over it with watered down gesso and then restamped on top of the paint. I've never seen anyone else doing this so maybe everyone else doesn't rate it much as a technique, but I like it so I'll keep on doing it! 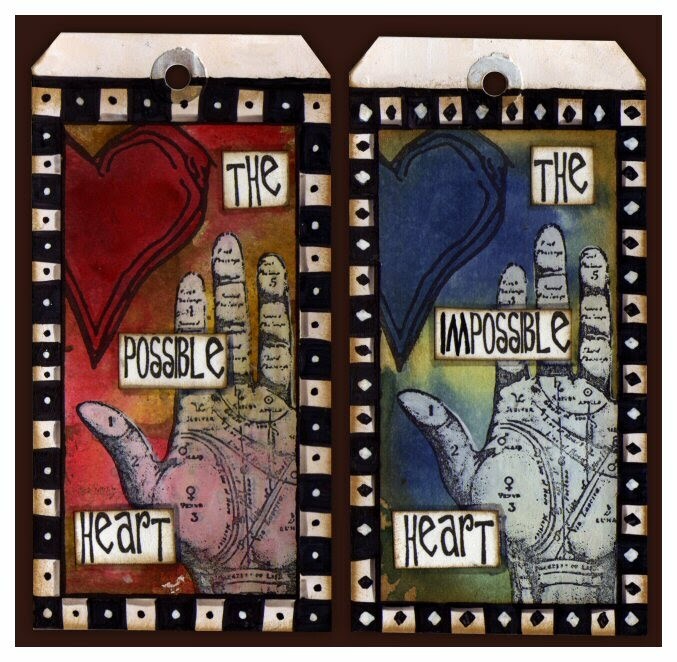 I used the From the Heart and Oddities stamp sets in addition to Claudine's gesso and a range of colours of distress stains. I have so many ideas brewing in my mind, this week truly is full of possibility. Be sure to click on our design team's blog links so you can see more photos (and full supply lists) for their projects. As always, Simon Says Stamp is giving away a $50 gift voucher that will go to a random entry chosen by Random Generator. To qualify all you need to do is create a new project that ties in (in any way!) with our theme and post it, along with a link back to this challenge, and add a link here. This challenge will end at 11:59pm on Sunday March 24th EST. For the full rules, read the "challenge rules" posted in the side-bar here on our blog. What stunning samples this week from the DT - they are all beautiful. My goodness! Stunning water creations by the DT--such a wonderful variety to inspire us! Love the variety of takes on water! Incredibly creative work by the DT. LOVE the challenge theme too! Thank you to the design team for another inspirational challenge here. Stunning creations and a fab challenge....Happy to be taking part. Love each DT members take on the challenge this week. Inspiring for sure! Such great art and fabulous takes on the water theme. This is a fun challenge - and oh, my, what absolutely AWESOME inspiration. I will be back to check them out a bit more. We are a group of vintage inspired crafters. From rusty junk to shabby chic, retro inspired to attic treasures, and anything in between we share a love of all things vintage. 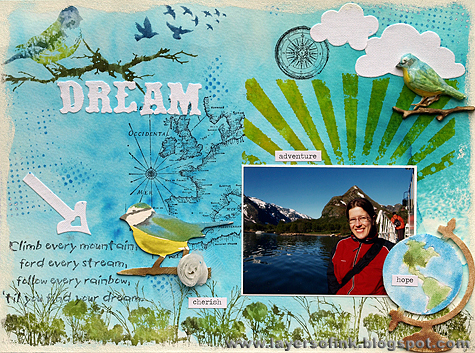 From scrapbooking to altered arts to cardmaking - we are a diverse group from all around the globe. Thank you for visiting the blog - we hope to inspire you to add some vintage touches into your next creation. * There are no rules as to what you may create – whether you are a card maker, mixed media artist, scrapbooker, or any other kind of crafter we welcome you! * You may enter up to five times per week. * Your link must be a direct link to your project posting, not a general link to your blog. * Creations must be posted on or after the date of the challenge. Older postings and projects are not eligible. * the project must be inspired in some way by our challenge. * Use of products purchased at Simon Says Stamp is not a requirement. * You must mention and link to the challenge on your blog/website to be eligible to win the prize. It is OK to use another online forum such as Flickr if you do not have a blog. * You are allowed to enter the project in more than one challenge, it does not have to be exclusive. * We respect copyright, please do not use images that have been copied without the manufacturer or designer's consent. Any entries found to breach copyright will be deleted. * If you would like one of our design team members to leave a comment, be sure you have comment verification turned off and/or that the site you've posted to does not require membership to comment. * All entries to be linked before midnight Eastern time on Sunday evening. * Each week a prize winner will be drawn randomly from the entries, and posted later that week (usually Thursday or Friday) after the entries have closed. The Blinkies for this blog were created using the Soft Vintage Digi Kit designed by NatashaNaSt Designs. Simon Says Stamp and Show. Powered by Blogger.